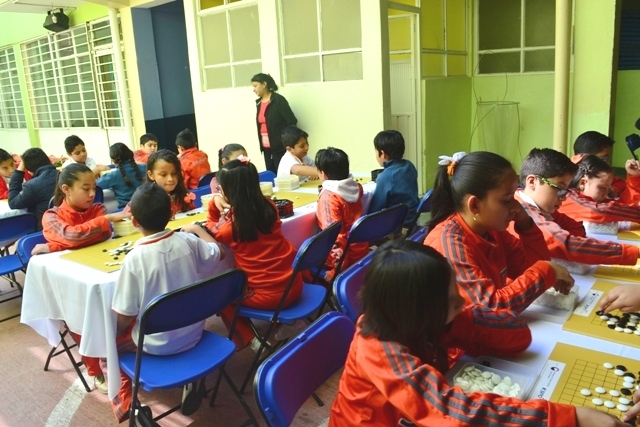 “Now there are two elementary schools in México City where go is part of the curriculum,” reports Siddhartha Avila, Mexican Youth Go Coordinator. “Pipiolo elementary has had an active go program since 2008 when Principal Marcela Zepeda first envisioned the educational benefits that go offers at early ages. All the top youth players in México have studied or study at her private K-6 school.” Now Colegio Serapio Rendón, is adding a program too. “I was contacted by Principals Gloria Pimentel and Dulce Pimentel,” says Avila, “they were looking for an instructor to implement a serious go program at their K-6 private school. We started with one hour a week for all grades, back in September. We ran a successful 13×13 tournament for 3rd to 6th graders on December 6th. The 1st Torneo Escolar de Go drew 34 students, playing 5 rounds. There was excellent coordination between the directors, teachers and staff; the schedule ran promptly, the students behaved well and played with great concentration.” The school tournament ended with prizes for the top 7 places, as well as a fighting spirit prize. Everybody recieved participation diplomas. “I’m glad we’ve found an activity where we can transmit love for knowledge, this helps kids’ development and critical thinking, their response to the game surpassed our expectations” says Gloria Pimentel.